My Thoughts: Remembrance by Michelle Madow was one of the first books I reviewed when I began blogging and Michelle was one of the first authors I was able to interview. I am so excited for her to have The Secret Diamond Sisters published by HarlequinTEEN and can not wait to read it! I love that you have a connect with the author it makes waiting more like Christmas. I haven't read any of Michelle's books, but this one sounds interesting. This sounds like a fun book, it definitely has a fun setting! I came across this on someone else's post for today... and it looks and sounds really interesting. I love the cover. I'll definitely be putting this on my 2014 reads list. I'm also giving away a copy of Perfect Ruin over on my blog here. This sounds really cool and I love how intriguing the cover is ;) This is definitely going on my TBR. Great pick! 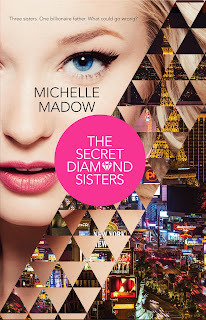 I haven't read anything by Michelle, but I am so excited for The Secret Diamond Sisters because of the local. There's not too many YA books set in Las Vegas.